Over the long memorial day weekend, Ali, Jonathan, and I drove down to the Sangre de Cristo range to climb some fourteeners. 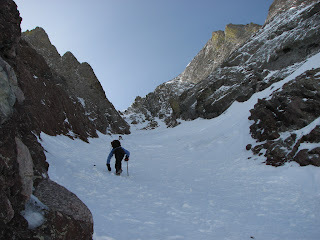 After being turned around by bad weather on Friday, we were able to climb the Northwest Couloir on Saturday. Here's a picture of the couloir that I took on Monday from the summit of Challenger Point. 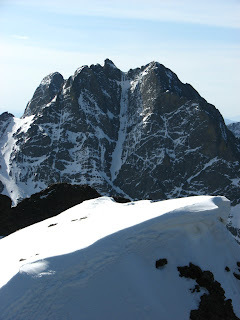 The Nortwest Couloir is the band of snow that runs up the middle of the peak.